Many of us are looking forward to the imminent opening of the rehabilitated Caminito del Rey / Kings walkway, one of the most spectacular landscapes of Malaga and probably Spain. The rehabilitation will end years of furtive excursions, precisely because its danger and being one of the most important climbing areas in Europe contributed to increase its fame, which turned the Caminito del Rey into one of the most dangerous trails of the world. The Caminito del Rey will be officially opened on March 26 and is open to the public on March 28. The first 6 months entry is free but reservation is mandatory through the website. You can only book a maximum of five tickets per person and two months in advance. Here we report on everything you need to know to plan a trip to this beautiful natural site. If you like nature, hiking and don´t suffer from vertigo, we highly recommend visiting this landmark, you’ll love it! The air path called “Caminito del Rey” is built about 100 meters above the Gaitanes Gorge. It has been remodelled with wood and metal anchors drilled into the rock. Some sections have glass floor so visitors can see the gorge and the old path, which remains as an example of architectural archaeology. 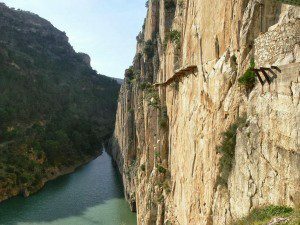 The current path of the Caminito del Rey is 7.7 kilometres, of which 4.8 kilometres are forest access tracks and 2.9 kilometres walkways. The estimated time for the complete route (section from one gateway to the other, plus the trails or forest roads to arrive / leave the area) ranges from 4 to 5 hours. Since the distance and the height difference is significant, this route is not recommended for people without a modicum of good health and young children. The entry is processed through the enabled website by filling out the form through which you obtain a code to get access. To visit the Caminito del Rey it is mandatory to be in possession of the corresponding entry which includes the name of the person and your ID or passport number, and the date, time and area of access to premises (Alora or Ardales, while circulation is maintained in both directions). Visitors and accompanied minors must carry at all times the entry along with your ID or equivalent document for possible checks which during the journey can be made by the staff. It is furthermore necessary to leave the premises. 1. The Caminito del Rey is a refurbished infrastructure to enjoy active tourism in a natural environment. Therefore, there is an inherent factor of risk and / or a degree of physical effort or skill, aspects that are assumed by visitors. Water or any kind of energy drink. Chocolate bars, energy bars, nuts and fruit. Sunscreen and hat, especially in summer. Clothing appropriate to the season and especially appropriate footwear for hiking. 3. The visitors should anticipate a possible lunch (sandwiches or processed foods) because once you have accessed the walkway there are no spaces enabled for it or nor is recommend a stop as it affects the flow of visitors. Therefore, you should have a lunch break before or after entering the walkway. 4. Visitors should note that since they enter the path until they leave the area there are no toilets. 5. Given the length of the route and the existence of sections with pronounced difference in height, the route is not recommended to anyone who does not have adequate physical preparation and who suffers from vertigo (the walkways are narrow, there is a significant height and near Alora you have to cross a suspension bridge). 7. 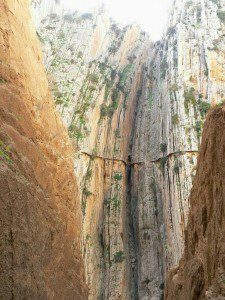 The Caminito del Rey path is linear, not circular, so make sure your return to the starting point by your own means. 8. Only children over 8 years can enter the premises. 9. It is prohibited to access the Caminito del Rey in the company of animals. November 1 to March 31 (Winter) 10 am to 2 pm every 30 min. April 1 to October 31 (Summer) 10 am to 5 pm every 30 min. From Malaga city take the A-357 towards MA-444, passing by the municipalities of Cartama, Pizarra, Carratraca and Ardales. This route is approximately 60 km and it takes 50 minutes by car to get there. In Pizarra you can also take the road to Alora and from there to the train station of El Chorro along the A-343. This route is slightly longer and it takes a little bit over an hour to get there. The road is narrower with many curves. From the train station El Chorro (Alora) it’s about 2 km walking passing by the chapel of Villaverde, the camping site and the iron bridge before arriving at the starting point of the Caminito del Rey. Find comprehensive information and the Online Reservation in the web page of the Council of Malaga in Spanish, English, German and French. Shuttle buses are already available at both entrances (Alora / El Chorro) so that visitors can do the full tour and return to the starting point using the bus. The route is from stop in El Chorro called ‘Caminito del Rey’ to the reservoir area (restaurant El Kiosko) and vice versa. The bus schedule is Tuesday through Sunday, every half hour on weekends and every hour on weekdays. Between April 1 and October 31, busses are running from 12:30 pm to 8:30 pm; while in winter time they run from 12:30 pm to 6:30 pm. The price is 1.55 Euros. 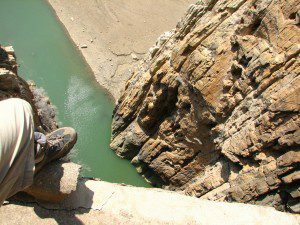 Update April 2016: The Caminito del Rey reopens on April 22. Tickets to tour the site can be booked from the 18th. Do you know when the tickets will be available for February 2016? Hello Pat! Until now the system is that reservations open two months before for the next batch, so lease check for end of November / beginning of December. Yet we have to tell you that by now we haven´t been able to get hold of not even one single ticket, as they literally “are gone” from one day to another. We made reservations for 2 people but the ticket only shows 1 name, is this correct? Hello Karen! We don´t know about this; please find attached a link where you can contact directly the official webpage, kind regards! Hi, there is no information anywhere on internet, how to get back from the end of the route to the car. Thank you for advice.